Turkey can impose sanctions against Russian metals companies. Turkey could finally be preparing to respond to Russian sanctions that were introduced nearly two months ago. In December 2015, Ankara merely hinted at a possible retaliation, but now it is getting ready to approve anti-dumping duties of up to 13.66 percent on Russian metals companies. This is significantly higher than Turkey’s estimates for Russian steel imports made in August 2015. Industry sources suggest that the anti-dumping probe has boiled down to nothing but politics, given that cheap Ukrainian imports have been excluded from such arrangements altogether. On January 22, 2016 the Turkish Ministry of Economy published the findings of an anti-dumping probe on the imports of hot-rolled steel into the country, which concluded that Russian metals companies had received a dumping margin of up to 13.66 percent. Metal companies from China, Slovakia and Japan were also found to have a margin of dumping. From 2012-2014, Turkey imported about three million tons of hot-rolled steel a year worth an average $1.8 billion, while in 2015 that amount increased to 4.3 million tons worth $2.15 billion, the report said. Prior to 2015, the countries suspected of dumping supplied Turkey with 1-1.3 million tons of steel a year (35-40 percent of all steel imports), while in 2015 they sold 2.3 million tons of steel on the Turkish market, worth $1.17 billion (53.3 percent). Russia accounts for 19.2 percent of all imports of hot-rolled steel into Turkey, the ministry said, considerably more than other countries: China accounts for 4.3 percent and Slovakia for 5.5 percent. According to the ministry’s figures, in 2015 Russia exported 825,000 tons of hot-rolled steel to Turkey worth $413 million. The metal came from MMK owned by Viktor Rashnikov, Vladimir Lisin’s NLMK company and Alexei Mordashov’s Severstal. The Turkish Ministry of Economy calculated that MMK had a dumping margin of 13.66 percent, NLMK featured a margin of 9.42 percent and Severstal had one of 12.43 percent. 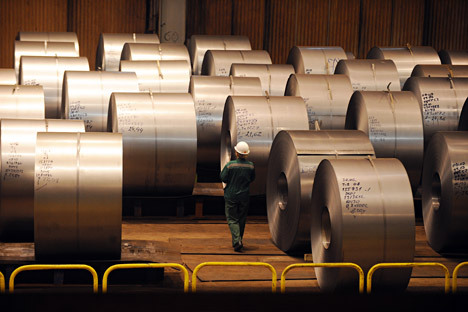 For its part, MMK insists that it sells its steel “at market prices and in strict compliance with national and international laws,” adding that the company “is employing all legal means to contest the introduction of anti-dumping duties.” NLMK and Severstal issued similar statements. The report by the Turkish Ministry of Economy says that some “nuances” of Russian metals companies’ costs, in particular the cost of raw materials, have resulted in a situation where these costs cannot be recognized as “rational.” In its calculations for Russia, the ministry used the cost of production in “equivalent countries” such as Slovakia, Romania, as well as Turkey.